A detailed course covering the fundamentals of PAT testing. Includes full length demonstrations, an online exam and personalised certificate. This PAT training course DVD features full-length demonstrations and detailed animations explaining PAT testing principles, electrical safety tests, legislation and code of practice. The DVD also includes a FAQ’s section, answering commonly asked questions. An online exam and a personalised, printable certificate showing you’ve passed are included. 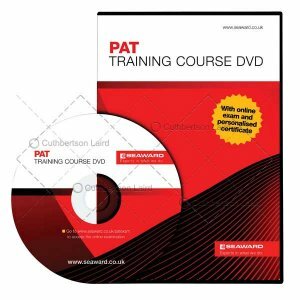 The DVD divides into interactive chapters so you can navigate from section to section until you’ve understood each subject fully and you’re ready for the exam. We are also offering this DVD free with every Seaward Europa Plus portable appliance tester bought from us. Chapter 3: Principles of PAT Testing. Chapter 5: Common Problems & FAQ.